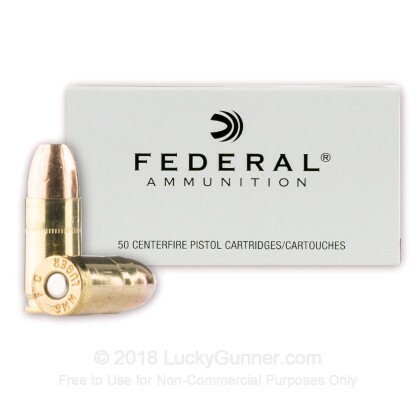 Federal Personal Defense Ammunition features a jacketed hollow point bullet that expands on impact for maximum stopping power. This ammunition is new production, non-corrosive, in boxer primed, reloadable brass cases. This ammo is priced right. If you want to use HP for target shooting, this is a good choice. I've gone through around 300 rounds of this, and I couldn't be happier. It's very accurate and clean. My groups are a fair bit tighter when I use this in either my Sig P226 or M&P 9. If pressed into service, I would be confident to use this ammo as a self defense round. Its older technology, but it still works pretty darn good. Of course its not HST, but its also not pricey, like those rounds. If it was between this ammo or premium FMJ's, I would go with HI-SHOK every time. Received merchandise quickly and was pleased with packaging. Shot about 100 rounds through my Taurus pt111 and had no issues. Feeds well and shoots well. Would definitely recommend. Great performing round at a bearable price. I have had issues with my XDs cycling some self defense ammo, this round cycles great, after 100 round I had no FTF or FTE's. Couldn't ask for a better buying experience - quick delivery!. Put a couple boxes through an XDS and a S&W 5904 with no problems. Now if only I could find some inexpensive 22LR! This is not the newest ammo, it has been around a good while, but it is still excellent. Feeds well in all 9mm's I have used it in. (Ruger SR9 and LC9, Browning Hi-Power, IAI Baby Eagle, S&W M&P Shield) It is a high quality "carry round" that is about 60% the price of most other good HP rounds. I feel very confident in it. Over the years I have fired about 2,000 rounds of this with one failure to feed, and the gun needed cleaning pretty bad, so I don't blame the ammo. Federal has got this one down right! Check out what Mas Ayoob says about it too. A couple words about LuckyGunner... The price was a little bit steeper than some other places, but they actually had it in stock. None of that backorder it and wait weeks or months nonsense. I ordered 1,000 rounds Tuesday afternoon and it was at my door Thursday evening. Can't beat that! When it arrived, the shipping box was damaged and one box of 50 rounds was missing, and one was damaged with six rounds missing. (FedEx issue, not LuckyGunner). One email to Lucky Gunner and two replacement boxes were at my house three days later, no questions asked. Now that is good service!! I will be back for more ammo from Lucky Gunner and more 9BP when my stocks run low. Excellent ammo, good value and great delivery by LG. Great ammo will never buy at gun shop again! ! Cycles perfectly in my Ruger SR9C. Generally recognized as the best standard pressure (non +P) defensive 9mm round made. 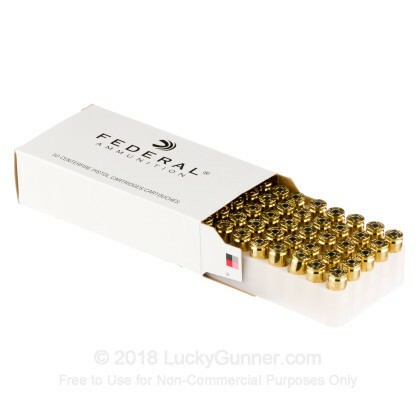 You should have a few boxes of this around, and train with cheaper FMJ/Ball 115gr standard pressure ammo (I use Winchester White Box when I can find it). Also is a great option for older guns that should not use +P ammo. Bottom line: you cannot go wrong with this cartridge; if it's in stock, gobble up as much as you can afford. Good ammo at a fair price. I Have used the Federal ammo in the past with no Issues. In a Glock and a Springfield XD. This is good ammo for backup. When volume counts, this is your brand. Clearly, this isn't Hornady Critical Duty. I'd rather have the Federal rounds going downrange, than nothing at all. I enjoyed shooting this ammo. Had no issues and felt and fired great. very happy with the product and the service is excellent. 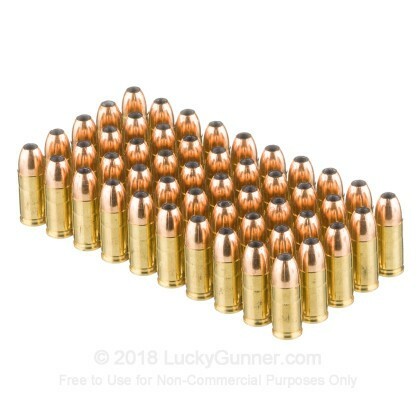 I Have used the Federal ammo in the past with no Issues what so ever, and will continue to use it ..
"I really don't know why they still make this loading. As a match round it's a good choice but better choices exist. As a defensive round it's been obsolete for over twenty years. (Posted on 2/14/13)"
So if the so called "Better Choices" are unavaliable, then I would think this is a very good choice at this time. Clean, high quality round, can be very accurate in some guns. This is the same Federal 9BP that used to be recommended so highly as a defensive round in all the gun magazines--25+ years ago. By 1980s standards it was about as well as you could do in 9mm. In the 21st Century there are vastly better choices. This bullet, reputedly manufactured for Federal by Nosler, is very prone to clogging and failure to expand when shot through any type of intermediate barrier, such as heavy clothing. It's also rather lightweight for caliber, and intermediate hard barriers like auto glass and sheet metal are very unkind to it. I really don't know why they still make this loading. As a match round it's a good choice but better choices exist. As a defensive round it's been obsolete for over twenty years. I have just purchased a Glock G19 Gen 4 & a Glock G26 Gen 4 I can't wait to get the ammo and try it on the range. My decision to buy was on everyone's 5 Star Rating. Looking forward to doing more business with Lucky Gunner. Really glad you do not have to wait and wait for delivery. this is really good stuff for a really good price. i've only shot a couple boxes of this stuff, but never had a problem. and its a sure bet that if i've bought it then it is the best deal that the time to be found. My recent purchase of this product was worth the peace of mind that I get when buying Federal ammunition products - reliability when it counts, and for self defense there are no second chances. Great quality hollow points for a reasonable price. I am very happy with the Ammo just ordered from Lucky Gunner. Have always had great service and quality. 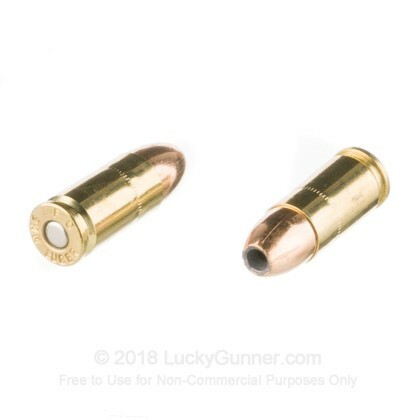 Looked all over the web and found LuckyGunner to be the best value and they shipped as fast as they claim. Good value for personal defense . At the range pretty much shoots like my practice ammo in my 9mm M&P ,will buy again . As always service and delivery was prompt from LuckyGunner. Great ammo, Great prices and very fast shipping. Doesn't get any better than that. 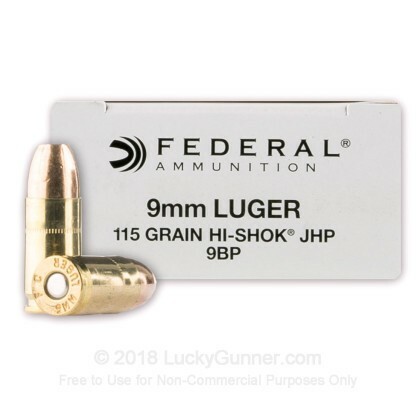 I just returned from the range to test my Federal classic hi-shok JHP ammo in 9 MM. I tested them in my Glock 19,my Taurus92 and my favorite gun, my Taurus PT 24/7 Pro. The ammo was accurate,clean, light recoil and most importantly had no jams, fail to feed or fail to fire. There were no stovepipes or ejections problems in any of the 9MM guns. I would highly recommend this ammo to amyone. Good price for a 9MM JHP. Seems to work well with my glock 19. No issues after 150 rounds. Was planning to use it for home defense but watched a youtube video on it. Two shoots through denum, then gel backed by three water jugs. This ammo went through jeans, gel and two jugs. There was no fragmentation. Questionable. should have stopped in the gel fragmented. Will use at range and look for HST type for home defense. I use this in my sub-compact 9mm's. It feeds well, patterns well, and has less felt recoil than 124 gr. loads. Ran 100 rounds through my SR9C with no problems. Clean ammo. Most affordable quality JHP ammo you can shoot at the range or carry for self defense. JHP Self-defence ammo is usually quite high priced. This ammunition feeds well, does the job and is inexpensive. I have shot about 5 boxes of this in my SW5906 with NO issues. Fairly clean burning ammo, and the ballistics match up fairly well with typical cheap 9mm ammo in 115FMJ. So you can have quality hollow-point defense ammo that shoots the same as your practice rounds. I buy Federal's 9BP as my #1 choice. Quality, reasonably priced,22222222 clean burning, accurate ammo that performed flawlessly in my P-229 on the range at 25 yards. Most defense ammo is to costly to practice with and even more serious to see if your handgun "likes" that sort of JHP ammo. This is an excellent way to accomplish both from a respected manufacturer. Went through a box, seems like a better value than $1 a round +P ammo. +P will probably have better stopping power, but since the Federal Classic has the same characteristics of 9mm target ammo, I think I'll put more rounds on target with this ammo, than I would with +P. In the end, no one's going to like being on the receiving end of this. This is one of the best deals on the web for a quality, tested JHP. I ran 100 rounds through my Springfield XD9sc without a hitch with good accuracy to 25 yards. Will buy again for sure. Excellent quality and an outstanding price. 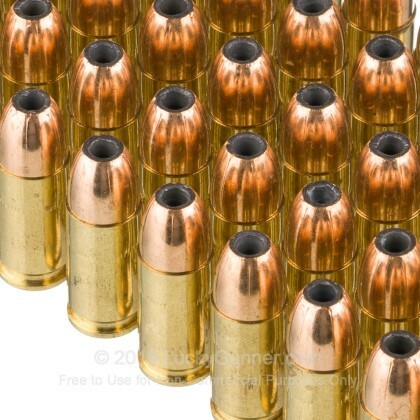 This is excellent ammunition at an excellent price. I have used Federal Hi-Shok ammunition for years and it delivers consistent performance. Good value for the price. The only non-+P ammo on the market that I couldn't find reports of inconsistant expansion. It's alo reported to have been the round of choice for the Philadelphia PD, at least prior to the introduction of "boutique" bullets. We also have this 9mm - 115 Grain JHP - Federal Classic Personal Defense - 1000 Rounds ammo in stock in a bigger quantity.